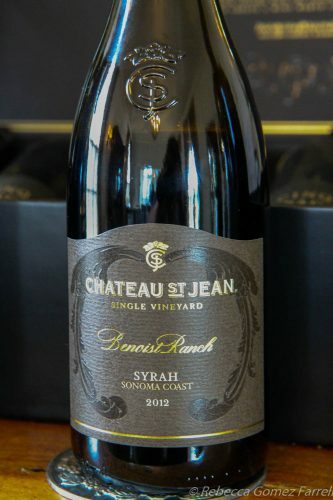 Chateau St. Jean is one of Sonoma’s most well-known and beautifully kept-up wineries. Last October, the fires that attacked wine country reached Chateau St. Jean. I was relieved, as were many wine lovers, when we learned that the estate’s main buildings had survived with only ash and smoke removal needed. 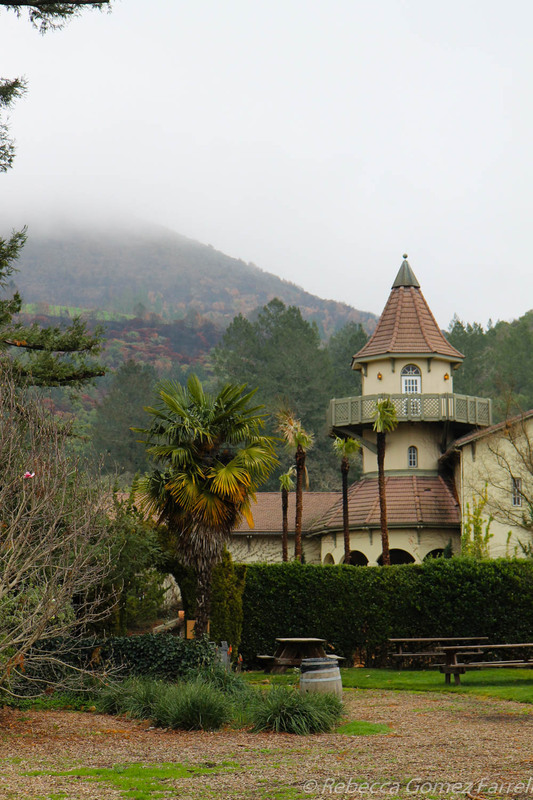 As part of a Wine Bloggers Conference pre-excursion in November, I had been scheduled to taste and tour Chateau St. Jean. 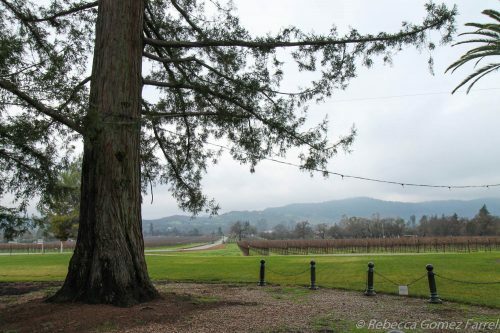 Understandably, Treasury Wine Estates, which owns Chateau St. Jean, subbed in another of their amazing wineries for that adventure – Stags’ Leap – as the chateau was not ready for guests quite yet. I’ll be writing about Stags’ Leap and Etude winery in another post, so look for that. 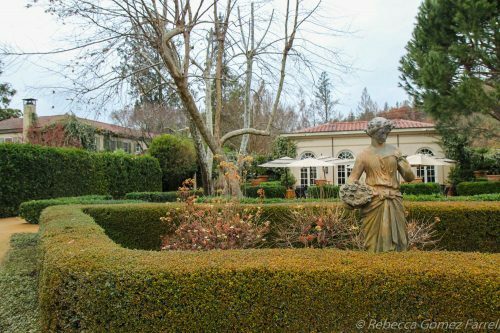 But I was impressed when Treasury Wine Estate’s representatives offered us the option to come back to Chateau St. Jean for a complimentary tasting when it reopened to the public. I am not one to let such an opportunity pass when I live just over an hour away from Sonoma. Looking toward the road from the grounds. 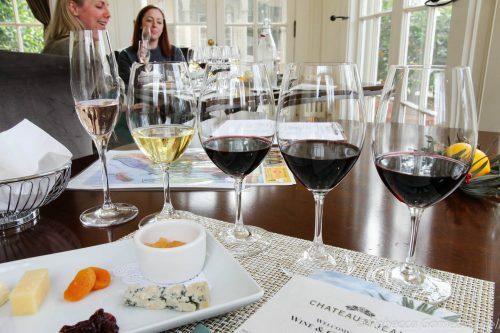 As food, drink, and travel is my beat, I asked to try Chateau St. Jean’s wine and cheese pairing, which at $35, is a pretty good deal for the area, especially at a winery of this caliber. Chateau St. Jean is most known for their Cinq Cepage Bordeaux blend, and I was delighted to see it would be included in this experience. But my visit began walking past the beautiful courtyard garden of Chateau St. Jean’s main grounds. 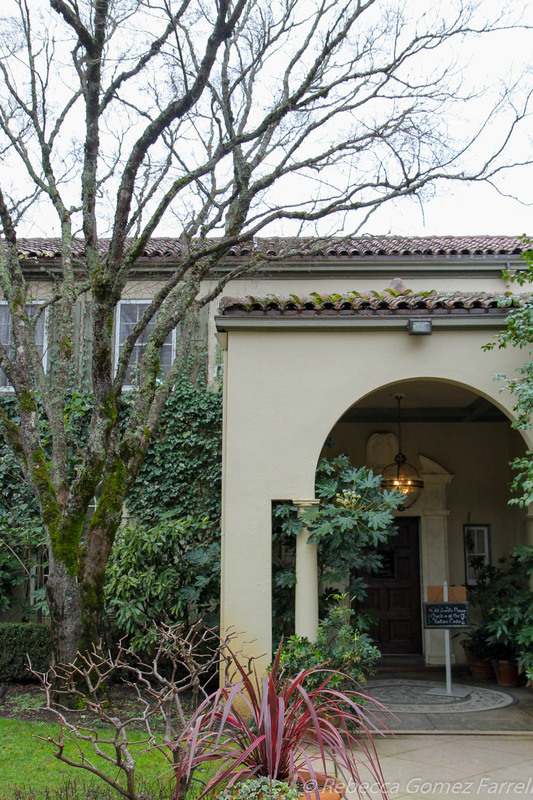 Inside, I was greeted with a glass of the delightful 2016 Chateau St. Jean Brut Rosé ($25, 5/5), a sparkling wine made from barbera and pinot noir grapes that they haven’t produced since 2000. I appreciate how sparkling wines awaken the palate, so it was perfect to sample right before the tasting proper. I loved the flint and tight bundles of pink berry it contained. I also loved the historic 100-year-old home in which the reserve tastings take place, which is the chateau in the name Chateau St. Jean. Visitors first check-in at the tasting room directly opposite, but the moment they walk through the chateau’s stately doors, the smell of wood envelops guests and the rooms it panels. 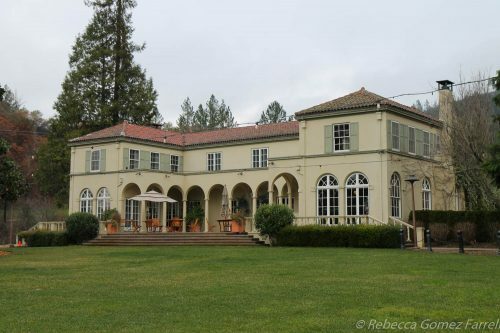 The chateau was the vacation home of the Goff family, the property’s original owners, and it dates back to the 1920s. My host, Geoff, introduced himself as a lover of history, and I have no doubt he can tell you a great deal about much of wine country’s past; he knows a great deal about Chateau St. Jean’s although he hasn’t been working there all that long. He brought me to a wonderfully sunny parlor set up for the day’s tastings. While guests are encouraged to sip and sample everything on the cheese plate with each of the paired wines, I did find that the matched pairings went best together. Two were standouts, which I’ll get to in a minute. Also on the plate were dried apricots and cherries and a phenomenal Meyer lemon and ginger jam. 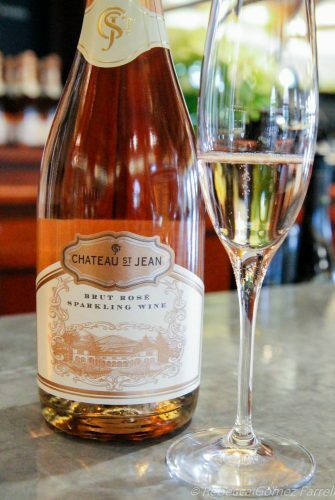 I fell in love with two of the featured wines, though neither of them are considered the best that Chateau St. Jean produces – I’m a wild card that way. 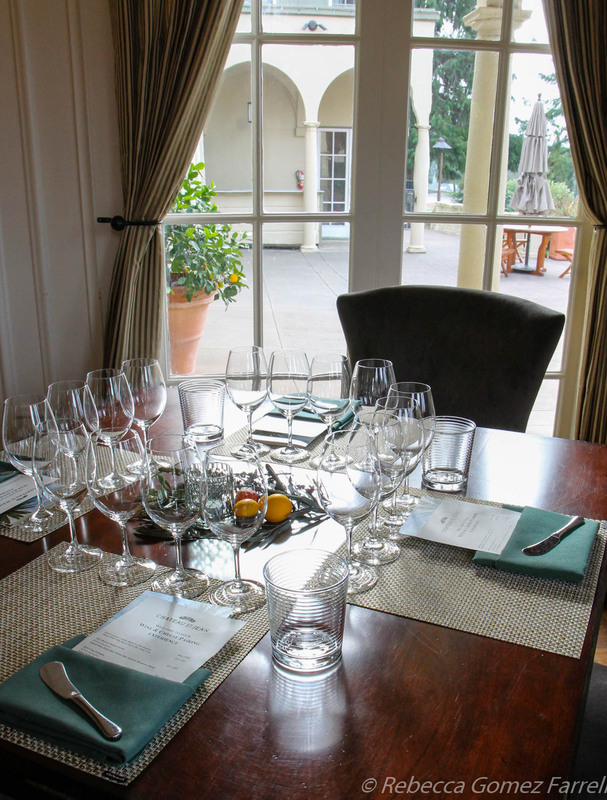 😉 The first was the first wine on the pairing menu: the Chateau St. Jean 2014 Sonoma Country Reserve Chardonnay ($50, 5/5). Chardonnay pictured second from the left. Its acidity tingled the tongue. The chardonnay presented a balanced combination of broth, cream, and butter notes, subtle yet savory. Lobster bisque sprang to mind as a potentially luminous pairing, though the Villa Cheese Co.’s Mezzo Secco cow’s milk dry jack cheese did very well, cutting through the wine’s cream with the sharpest jack flavor I’ve ever tasted. Geoff informed me that the Mezzo Secco was originally made during World War II for soldiers to take overseas, and the company brought it back in the early 2000s. The next glass, of the 2012 Chateau St. Jean Benoist Ranch Syrah ($50), yielded an excellent argument for the virtue of a good pairing. By itself, I gave the wine a 3.5/5 for its earthy spice of anise, thyme, white pepper, mint, and oregano with a layer of tobacco. It yielded visions of roasted lamb. The nose was inky and full of violet perfume. That’s a lot for one glass of wine to contain, perhaps making it too overwhelming on its own, but give it the depth of this pairing and WOW. With a bite of Bellwether Farms’ San Andreas sheep’s pecorino, my rating shot straight up to a 4.5/5. The super creamy cheese instantly mellowed the wine’s audacious profile, guiding it to a life of contentedness. 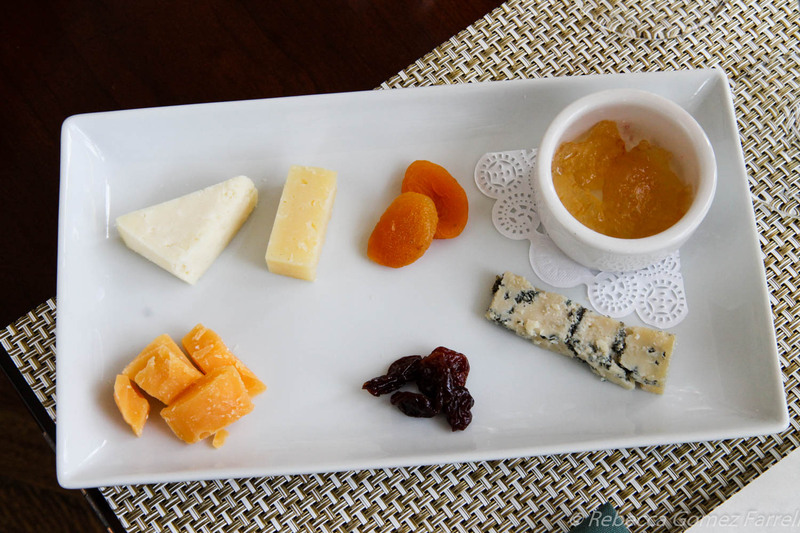 The winery’s signature Cinq Cepages was paired with Beemster XO Extra-Aged Gouda. As a pairing, it did not surpass the high bar set by the previous one, as I found I preferred each of them more on their own merits. 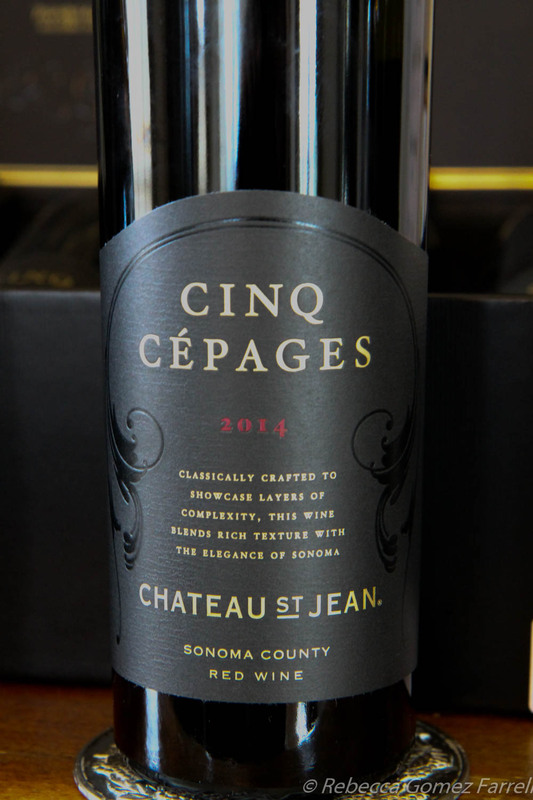 Regardless, the 2014 Chateau St. John Cinq Cepages ($85, 4.5/5) is assuredly a glass worth lingering over. The nose is full of fruit and dried petals, which lay down a trail through the wine’s gorgeous velvet mouthfeel and plum and cherry notes. It’s a romantic wine that would go great with Greek food, if you feel the need to pair it with anything at all. The gouda brightened the wine’s notes, but I preferred to keep them lusciously deep. Drinking the wine again after a bite of dried cherry brought me right back to that profile. The final pairing was the second-most impressive of the evening: the 2014 St. Jean Estate Cabernet Franc ($60, 4.5/5) with Pt. Reyes Farmstead’s Bay Blue cow’s milk blue cheese. The wine offered a muted nose of dust and toothpicks that hides an adventurous spirit. In the glass, chunky rhubarb notes are pricked by sharp tannins that encourage exploration rather than incite pain. I found the super creamy blue cheese interacted with the wine in much the same way as mold veins its way through a blue cheese wheel. They amplified each other’s best qualities, creating a greater whole while maintaining their individual personalities. 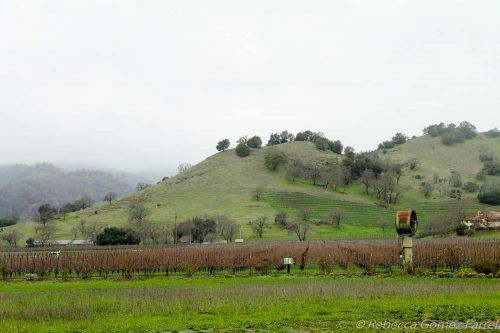 Sadly, there is not likely to be a 2017 vintage of cabernet franc at Chateau St. Jean, as those vines were the only ones still unharvested when the fire came through. The chateau against the burned hillside. This last fall was the 37th harvest of winemaker Margo Van Staaveren’s career, and it’ll be one of the most challenging for blending the Cinq Cepage as well, as cabernet franc is usually included. But I have no doubt she’ll conjure something beautiful out of those ashes, as her skill is evident in each of the wines I tasted this day. Plus, the view is rather inspiring. In addition to the wine and cheese pairings, Chateau St. Jean offers general tastings ($15, and open to walk-ins), reserve tastings ($25; the 2014 Reserve Pinot Noir is a breezy, celebratory toast to bright fruit), and personally tailored tastings ($50). Reservations are required for most and recommended for all. This time of the year, the winery was not crowded, but don’t expect that to last into spring. Tasting enjoyed 11 January 2018.